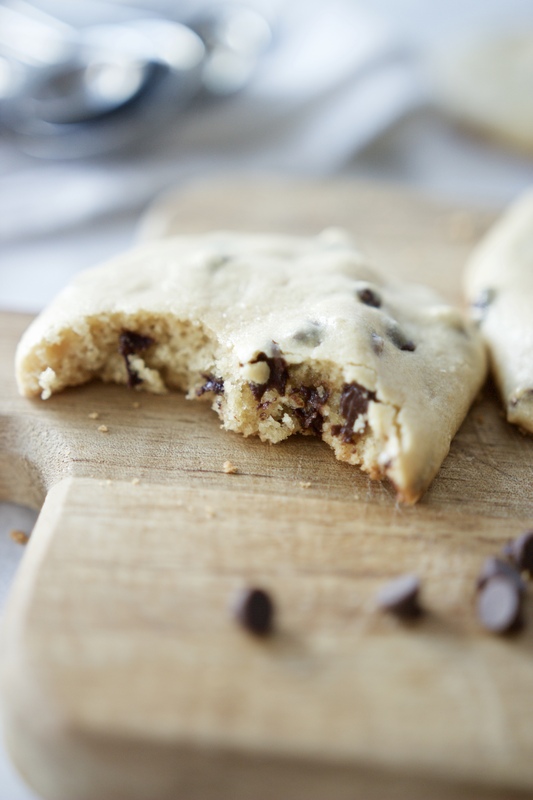 If you love chocolate chip cookies, you’ll love these Chewy Chocolate Chip Tahini Cookies. A paleo twist on a classic favourite. Full disclosure: I’ve made close to 10 batches of these Chewy Chocolate Chip Tahini cookies over the past week. Mainly because a) they’re delicious, and b) I wanted to make sure this recipe was 100% perfect. So, naturally, you gotta make and eat a lot of cookies, right?! There’s so much I love about these cookies. 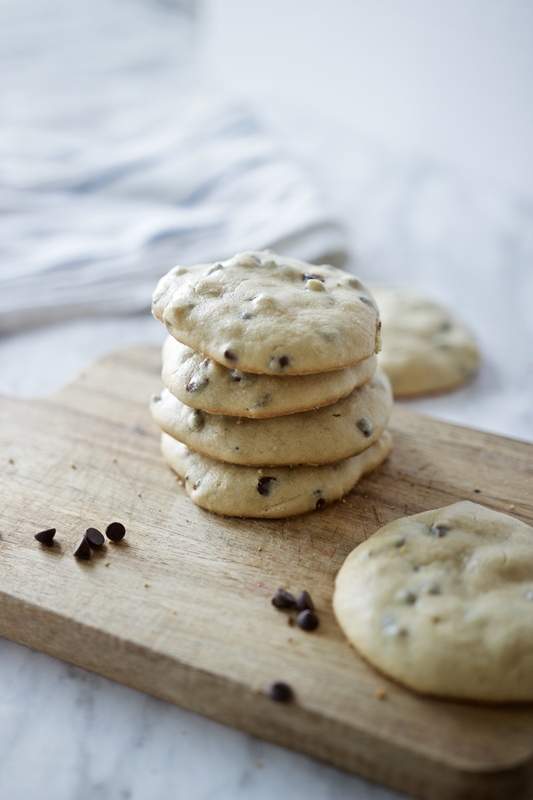 I think what I love about them most is that they’re completely paleo (grain-free, dairy-free) yet their taste and texture is just as good as any other regular ol’ chocolate chip cookie I’ve had! Why use flour when you can use mineral-rich tahini? Tahini is the second reason why I love these cookies so much. Also known as sesame seed butter, tahini gives these cookies a big nutritional boost featuring healthy fats and minerals like calcium and zinc. Plus it’s light, creamy colour makes these resemble any other white flour-based treat. 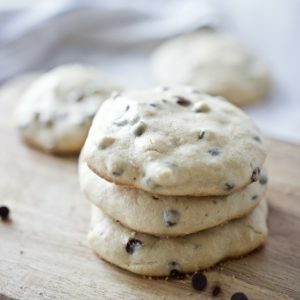 I’d say these cookies are softer or fluffier than a regular chocolate chip cookie. But then again, there are so many ways to make cookies. I personally love them chewy as opposed to crunchy, so I’m pretty darn pleased with this recipe! I like to use dairy-free chocolate chips for this recipe. I like the brands Enjoy Life or MadeGood for allergen-free options! A soft, fluffy chocolate chip cookie made with tahini instead of flour for a paleo twist on a classic treat. Combine coconut flour, baking powder and salt (dry ingredients) in bowl. In separate bowl, add wet ingredients and stir until thoroughly combined. Stir dry ingredients into wet and let sit for 3-5 minutes to allow coconut flour to absorb moisture. Line baking sheet with parchment paper or coconut oil and scoop dough onto pan, about 1 heaping tbsp scoops. 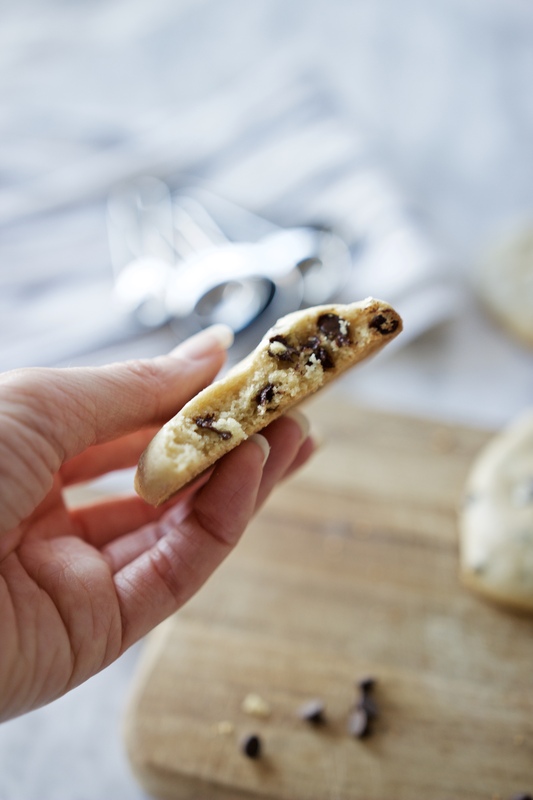 Flatten into cookie shape with spoon (if desired) as the dough holds whichever shape you bake them in. Bake for 10 minutes until firm to the touch. Cookies will remain very light in colour once cooked. Let cool and enjoy! Store in container for 3-5 days. 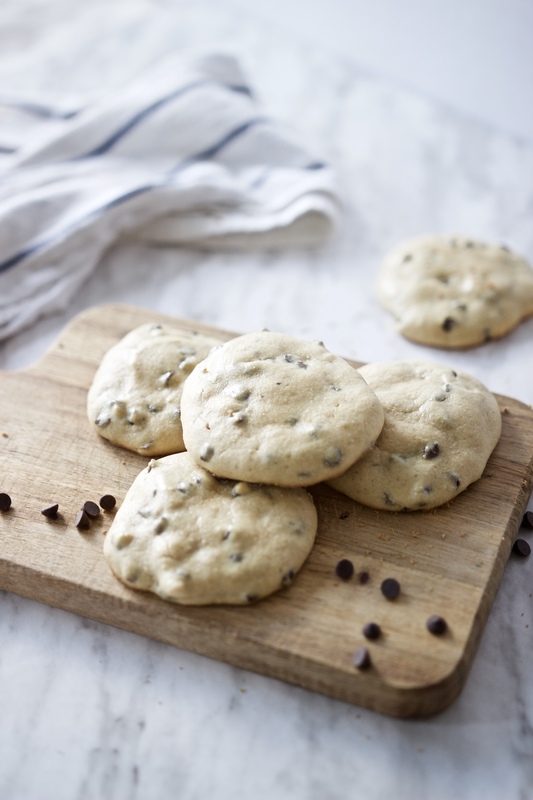 Are you a chocolate chip cookie lover? Have you ever baked with tahini? Can you substitute almond flour? Hey Sylvia. I’ve never made them with almond flour so I can’t say for sure – but I wouldn’t be surprised if they were still delicious! I’d say give it a try. Let me know how it turns out if you try it out! I would love to know how almond flour works if you try this out! My daughter has a coconut allergy. I’m wondering if I want to use sugar instead of honey should I add the same amount? Only 4 tablespoons! Yum – these look so tasty! 🙂 I will definitely be trying them out when I am home for break. Thanks for sharing! My cookie dough was really thin… I hope they turn out okay! The cookie dough was really thin… Hope they turn out okay! This is fantastic and I love all your recipes! Thank you so much for generously sharing! I really enjoy your YouTube channel and it’s awesome these are all here! What brand or specific type of tahini do you use?